To believe Palestinian spokesmen, the violence was caused by the desecration of a Muslim holy place ? Haram al-Sharif (the Temple Mount) ? by Likud leader Ariel Sharon and the thousands of Israeli soldiers who accompanied him. The violence was carried out through unprovoked attacks by Israeli forces, which invaded Palestinian-controlled territories and massacred defenseless Palestinian civilians, who merely threw stones in self-defense. The only way to stop the violence, then, was for Israel to cease fire and remove its troops from the Palestinian areas. The truth is dramatically different. The violence started before Sharon's September 28, 2000, visit to the Temple Mount. The day before, for example, an Israeli soldier was killed at the Netzarim Junction. The next day in the West Bank city of Kalkilya, a Palestinian police officer working with Israeli police on a joint patrol opened fire and killed his Israeli counterpart. Official Palestinian Authority media exhorted the Palestinians to violence. On September 29, the Voice of Palestine, the PA's official radio station sent out calls "to all Palestinians to come and defend the al-Aqsa mosque." The PA closed its schools and bused Palestinian students to the Temple Mount to participate in the organized riots. Just prior to Rosh Hashanah (September 30), the Jewish New Year, when hundreds of Israelis were worshipping at the Western Wall, thousands of Arabs began throwing bricks and rocks at Israeli police and Jewish worshippers. Rioting then spread to towns and villages throughout Israel, the West Bank and Gaza Strip. Internal Security Minister Shlomo Ben-Ami permitted Sharon to go to the Temple Mount ? Judaisms holiest place, which Muslims have renamed Haram al-Sharif and regard as Islams third holiest place ? only after calling Palestinian security chief Jabril Rajoub and receiving his assurance that if Sharon did not enter the mosques, no problems would arise. The need to protect Sharon arose when Rajoub later said that the Palestinian police would do nothing to prevent violence during the visit. Sharon did not attempt to enter any mosques and his 34 minute visit to the Temple Mount was conducted during normal hours when the area is open to tourists. Palestinian youths  eventually numbering around 1,500  shouted slogans in an attempt to inflame the situation. Some 1,500 Israeli police were present at the scene to forestall violence. There were limited disturbances during Sharon's visit, mostly involving stone throwing. During the remainder of the day, outbreaks of stone throwing continued on the Temple Mount and in the vicinity, leaving 28 Israeli policemen injured, three of whom were hospitalized. There are no accounts of Palestinian injuries on that day. Significant and orchestrated violence was initiated by Palestinians the following day following Friday prayers. The real desecration of holy places was perpetrated by Palestinians, not Israelis. In October 2000, Palestinian mobs destroyed a Jewish shrine in Nablus ? Josephs Tomb ? tearing up and burning Jewish prayer books. They stoned worshipers at the Western Wall and attacked Rachels Tomb in Bethlehem with firebombs and automatic weapons. None of the violent attacks were initiated by Israeli security forces, which in all cases responded to Palestinian violence that went well beyond stone throwing. It included massive attacks with automatic weapons and the lynching of Israeli soldiers. Most armed attackers were members of the Tanzim ? Arafats own militia. Since all attacks were initiated by Palestinians under Arafats orders, only Arafat has the power to end the violence. Israel and the United States have repeatedly called on him to do so and renew the peace process. During the "al-Aqsa intifada," the number of Palestinian casualties has been higher than the figure for Israelis; however, the gap has narrowed as Palestinian suicide bombers have used increasingly powerful bombs to kill larger numbers of Israelis in their terror attacks. As of mid-July 2002, 1,779 Palestinians had been killed and 778 Israelis. The disproportionate number of Palestinian casualties is primarily a result of the number of Palestinians involved in violence and is the inevitable result of an irregular, ill-trained militia attacking a well-trained regular army. The unfortunate death of noncombatants is largely due to the habit of Palestinian gunmen and terrorists using civilians as shields. What is more revealing than the tragic totals, however, is the specific breakdown of the casualties. According to one study, Palestinian noncombatants were mostly teenaged boys and young men. "This completely contradicts accusations that Israel has indiscriminately targeted women and children,' according to the study. "There appears to be only one reasonable explanation for this pattern: that Palestinian men and boys engaged in behavior that brought them into conflict with Israeli armed forces." By contrast, the number of women and older people among the noncombatant Israeli casualties illustrates the randomness of Palestinian attacks, and the degree to which terrorists have killed Israelis for the "crime" of being Israeli.3b Israeli troops do not target innocent Palestinians, but Palestinian terrorists do target Israeli civilians. The basis of the peace process is that disputes should be resolved through negotiations. One of the conditions Israel set before agreeing to negotiate with the PLO was that the organization renounce terrorism. It formally did so; however, the PLO and other Palestinian groups and individuals have consistently resorted to violence since the Oslo process began in 1993. Whether or not Israel made concessions, Palestinians have still committed heinous attacks. In some instances atrocities are perpetrated because of alleged mistreatment; in other cases, they are deliberate efforts to sabotage negotiations. Regardless, the Palestinian Authority, which has a nearly 40,000-person police force (larger than allowed under the peace agreements) and multiple intelligence agencies, must be held responsible for keeping the peace. Palestinian violence in the West Bank and Gaza has taken the lives of numerous civilians and soldiers. In addition, terrorists acting in the name of the uprising have carried out heinous attacks inside Israel. The violence also has collateral impact on the Israeli psyche, military and economy. Israelis must now be careful traveling through many parts of Israel and the territories that should be safe. Palestinians have also sniped at Jews in cities such as Gilo that are outside the territories. The violence has severely undermined the faith Israelis had that if they made territorial concessions, peace with the Palestinians was possible. The uprising also affects military readiness because troops must be diverted from training and preparing against threats from hostile nations and instead must focus on quelling riots and fighting terrorism. It is not only the Israelis who suffer. The loss of tourism also hurts Palestinians. The number of visitors, for example, who normally visit Bethlehem for Christmas was significantly lower than usual. The same is true in other pilgrimage sites in the Palestinian Authority. Palestinian shopkeepers in places like the Old City are also affected by the drop in tourism. Terrorist attacks also force Israel to periodically prohibit Palestinian workers from entering Israel, hurting individuals trying to make a living and provide for their families. Palestinians, young and old, attack Israeli civilians and soldiers with a variety of weapons. When they throw stones, they are not pebbles, but large rocks that can and do cause serious injuries. Typically, Israeli troops under attack have numbered fewer than 20, while their assailants, armed with Molotov cocktails, pistols, assault rifles, machine guns, hand grenades and explosives, have numbered in the hundreds. Moreover, mixed among rock throwers have been Palestinians, often policemen, armed with guns. Faced with an angry, violent mob, Israeli police and soldiers often have no choice but to defend themselves by firing rubber bullets and, in life-threatening situations, live ammunition. The use of live-fire by the Palestinians has effectively meant that Israeli forces have had to remain at some distance from those initiating the violence. In addition, the threat of force against Israelis has been a threat of lethal force. Both factors have inhibited the use of traditional methods of riot control. According to the rules of engagement for Israeli troops in the territories, the use of weapons is authorized solely in life-threatening situations or, subject to significant limitations, in the exercise of the arrest of an individual suspected of having committed a grave security offense. In all cases, IDF activities have been governed by an overriding policy of restraint, the requirement of proportionality and the necessity to take all possible measures to prevent harm to innocent civilians. Meanwhile, the Palestinians escalated their violent attacks against Israelis by using mortars and anti-tank missiles illegally smuggled into the Gaza Strip. Palestinians have fired mortar shells into Jewish communities in Gaza and Israel proper and IDF reports indicate that anti-tank missiles have been fired at Israeli forces in Gaza. IDF Chief of Staff Shaul Mofaz told visiting American Jewish leaders on Feb. 28, 2001, that the Palestinian Authority (PA) has been stockpiling weapons smuggled into Gaza by sea and underground tunnels linked to Egypt. It is only Israelis who are denied their right to self-defense or see it used as a propaganda weapon against them. The PA is also filled with illegal weapons, including machine guns, hand grenades, explosives and mortars. Despite repeated promises, no effort has been made to collect the weapons. On the contrary, the PA has been actively stockpiling them. This is a serious violation of the agreements signed with Israel, one that provokes mistrust and threatens Israeli security. Perhaps the most vivid image of the "al-Aqsa intifada" was the film of a Palestinian father trying unsuccessfully to shield his son from gunfire. Israel was universally blamed for the death of 12-year-old Mohammed Aldura, but subsequent investigations found that the boy was most likely killed by Palestinian bullets. The sketch below shows an IDF aerial photo of the Netzarim junction in the Gaza Strip where Mohammed Aldura, 12, was killed. 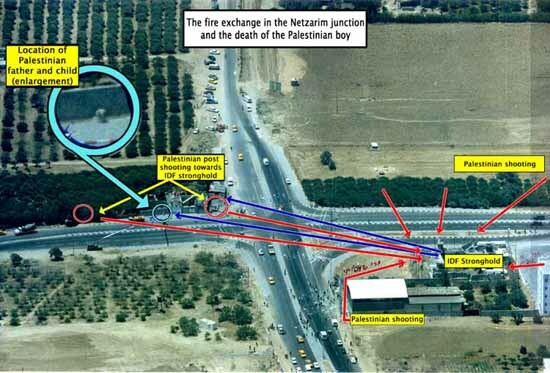 The sketch marks the location of the father and son who took cover adjacent to a Palestinian shooting position at the junction. After Palestinian policemen fired from this position and around it toward an IDF position opposite, IDF soldiers returned fire toward the sources of the shooting. 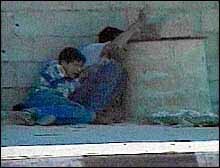 During the exchanges of fire, the Palestinian child was hit and killed. Rubber bullets are an imperfect means of pacifying a violent mob. They are designed to minimize the risk of serious injury but they cannot alleviate it altogether. In the overwhelming majority of cases, rubber bullets do not cause death or serious injury. In many circumstances, they may be the only available option short of live-fire. Children using guns, or intent on causing injury or death to their intended target by some other means, pose a lethal threat, particularly when that threat takes the form of a large-scale attack. Many police forces around the world use rubber bullets to disperse violent crowds. For example, following the victory of the Los Angeles Lakers in the 2001 National Basketball Association finals, Los Angeles police used rubber bullets to end violent outbursts by rowdy fans.13a The police felt compelled to use this method of crowd control with a group of overly exuberant basketball fans who turned violent celebrating their team's victory, while Israel uses it against a hostile population with whom it is essentially at war. In November 2000, former U.S. Senator George Mitchell was appointed to lead a fact-finding committee to investigate the cause of the "al-Aqsa Intifada" and explore how to prevent future violence. The report his committee issued on April 30, 2001, did recommend a settlement freeze  as one of more than 15 different confidence-building measures  but Mitchell and Warren Rudman, another member of the committee, explicitly stated in a letter clarifying their view: "We want to go further and make it clear that we do not in any way equate Palestinian terrorism with Israeli settlement activity, 'seemingly' or otherwise." How do you determine the proportionate use of military force? When Palestinian terrorists plant bombs at Israeli shopping malls and kill and wound dozens of civilians, would the proportionate response be for Israelis to plant bombs in Palestinian malls? No one in Israel believes this would be a legitimate use of force. Thus, Israel is left with the need to take measured action against specific targets in an effort to either deter Palestinian violence or stop it. Israel's deployment of the fighters came after 88 Israelis had already lost their lives, including 55 civilians. The civilians were not killed accidentally, they were deliberately targeted. In the previous two-and-a-half months, Palestinians had attempted to place 28 bombs inside Israel. The F-16 attack came in direct response to one that exploded at a Netanya shopping mall May 18, 2001, killing five Israelis. General Powell insisted on deploying overwhelming force before going to war against Iraq in the Gulf War. The Allied force of more than half a million troops demolished Saddam Hussein's army at a cost of fewer than 200 American lives while approximately 35,000 Iraqis were killed, including many civilians. The U.S. also deployed massive force in the Balkans and, in 1999, accidentally bombed the Chinese embassy in Belgrade killing three and injuring 20. The United States has not hesitated to use overwhelming force against its adversaries, even though the threats have been distant and in no way posed a danger to the existence of the nation or the security of its citizens. While U.S. military objectives were accomplished, they also were routinely accompanied by errors and collateral damage that resulted in the loss of civilian lives. Israel is in a different position. The threat it faces is immediate in time and physical proximity and poses a direct danger to Israeli citizens. Still, Israel has not used its full might as the Powell Doctrine dictates. The use of force has been judicious and precise. In those instances where mistakes occur  as inevitably happens in war  the incidents are investigated. The bottom line is that Israel would have no need to respond with military force if the Palestinians were not attacking its citizens and soldiers. The idea that Palestinian violence is spontaneous is countered by the organized way that attacks against Israel are often carried out and the expressed intention of Palestinians, particularly from terrorist groups like Hamas, to wage war so long as a Jewish state exists. The premise of the peace process was that by reaching an agreement with Yasser Arafat, violence could be controlled. If he cannot control the behavior of the people under his authority, then the agreements have little value. On the other hand, if he does have control, then it is clear he is using it to foment violence rather than prevent it. The evidence suggests that Arafat does in fact have control over most activities by Palestinians in the West Bank and Gaza Strip. Approximately 97 percent of the Palestinian population is now under his jurisdiction. Arafat has demonstrated an ability to quickly eliminate Palestinians who challenge his rule by arresting and, in some cases, executing them. When he chooses, he has also arrested members of terrorist groups, but he has routinely released them so they can continue to attack Israel. He has allowed the terrorist organizations to produce explosives, build mortars, train members and recruit youngsters for suicide missions. On May 22, 2001, Prime Minister Ariel Sharon declared a unilateral cease-fire in an effort to calm the situation, and in the hope the Palestinians would reciprocate by ending their violent attacks against Israelis. Instead the Palestinians intensified the level of violence directed particularly at Israeli civilians. Yasser Arafat did nothing to stop or discourage the attacks. More than 70 attacks were recorded in the next 10 days, during which Israel held its fire and eschewed any retaliation. The campaign of Palestinian terror during the Israeli cease-fire culminated with the suicide bombing at a Tel Aviv disco June 1 that killed 20 people and injured more than 90, mostly teenagers. In the face of overwhelming international pressure generated by the horrific attack, and the fear of an Israeli counterattack, Arafat finally declared a cease-fire. It too didn't last. At the beginning of 2001, Israel decided to withhold more than $50 million in taxes it owed to the Palestinian Authority (PA) in response to the ongoing violence. U.S. officials, and others, pressured Israel to transfer the money because of the PA's dire financial straits and inability to pay many of its bills. Israel recognized that its action was harsh, but believed it was necessary to demonstrate to the Palestinians that the inability or unwillingness to stop the violence had a cost. Israel must use whatever leverage it can to protect its citizens and this economic sanction was a milder response than a military one. Israel is faced with a nearly impossible situation in attempting to protect its civilian population from Palestinians who are prepared to blow themselves up to murder innocent Jews. One strategy for dealing with the problem has been the peace process. Since 1993, Israel believed that negotiating was the way to reach peace with the Palestinians, but after Israel gave back much of the West Bank and Gaza Strip, and offered virtually all of the remainder, the Palestinians rejected their concessions and chose to use violence to try to force Israel to capitulate to all their demands. Targeting the terrorists has a number of benefits. First, it places a price on terror: Israelis can't be attacked with impunity anymore, for terrorists know that if they target others, they will become targets themselves. Second, it is a method of self-defense: pre-emptive strikes eliminate the people who would otherwise murder Jews. While it is true that there are others to take their place, they can do so only with the knowledge they too will become targets. Third, it throws the terrorists off balance. Extremists can no longer nonchalantly plan an operation; rather, they must stay on the move, look over their shoulders at all times, and work much harder to carry out their goals. Of course, the policy also has costs. Besides international condemnation, Israel risks revealing informers who often provide the information needed to find the terrorists. Soldiers also must engage in sometimes high-risk operations that occasionally cause tragic collateral damage to property and persons. The most common criticism of "targeted killings" is that they do no good because they perpetuate a cycle of violence whereby the terrorists seek revenge. This is probably the least compelling argument against the policy, because the people who blow themselves up to become martyrs could always find a justification for their actions. They are determined to bomb the Jews out of the Middle East and will not stop until their goal is achieved. It is always a tragedy when innocent civilians are killed in a counterterrorism operation. Civilians would not be at risk, however, if the Palestinian Authority arrested the terrorists, the murderers did not choose to hide among noncombatants, and the civilians refused to protect the killers. Israel does not attack Palestinian areas indiscriminately. On the contrary, the IDF takes great care to target people who are planning terrorist attacks against Israeli civilians. Israeli forces have a history of accuracy in such assaults, nevertheless, mistakes are sometimes made. Whereas the terrorists make no apology for their attacks on civilians, and purposely target them, Israel always investigates the reasons for any errors and takes steps to prevent them from reoccurring. Israel is not alone in using military force against terrorists or in sometimes inadvertently harming people who are not targets. For example, on the same day that American officials were condemning Israel because a number of civilians died when Israel assassinated the leader of the military wing of Hamas, news reports disclosed that the United States bombed a village in Afghanistan in an operation directed at a Taliban leader that instead killed 48 Afghan civilians at a wedding party. In both cases, flawed intelligence played a role in the tragic mistakes. Israel did not arbitrarily choose to raid the refugee camp in Jenin. It had little choice after a series of suicide bombings had terrorized Israeli civilians for the preceding 18 months. To defend itself and bring about hope for peace, Israeli forces went into Jenin to root out one of the principal terrorist bases. The Palestinian Authority's own documents call Jenin the "suiciders capital." The camp has a long history as a base for extremists, and no less than 28 suicide attacks were launched from this terror nest during the recent wave of violence. These terrorists violated the cease-fire agreed to by Israel and undermined Israeli efforts to resume political negotiations toward a final peace agreement. The majority of casualties were gunmen. Palestinian snipers targeted soldiers from a girls' school, a mosque, and a UNRWA building, and in returning fire and pursuing terrorists some noncombatants were hit. Any civilian casualty is a tragedy, but some were unavoidable because Palestinian terrorists used civilians as shields. While Israel could have chosen to bomb the entire camp, the strategy employed by the U.S. in Afghanistan, the IDF deliberately chose a riskier path to reduce the likelihood of endangering civilians. Soldiers went house to house and 23 were killed in bitter combat with Palestinian terrorists using bombs, grenades, booby-traps and machine guns to turn the camp into a war zone. Television pictures gave a distorted perspective of the damage in the camp as well. Jenin was not destroyed. The Israeli operation was conducted in a limited area of the refugee camp, which itself comprises a small fraction of the city. The destruction that did occur in the camp was largely caused by Palestinian bombs. Palestinians have learned from fabricating atrocities stories in the past that a false claim against Israel will get immediate media attention and attract sympathy for their cause. The corrections that inevitably follow these specious charges are rarely seen, read, or noticed. The hypocrisy of the UN and others concerned about Jenin is evident from the fact that they never condemn or investigate the repeated massacres by Palestinian homicide bombers. One of the unfortunate results of the violence during the "al-Aqsa intifada" has been the allegations of Israeli abuse against Palestinian Red Crescent ambulances. Various human rights groups, and politicians throughout the Arab world, have accused Israel of gratuitously delaying ambulances attempting to cross from the West Bank into Israel proper, resulting in inconveniences, medical complications, and even death to the sick passengers on board. These accounts tend to portray the delays as wanton acts of cruelty on the part of Israeli soldiers against Palestinians in need of medical attention. On May 17, 2002, an explosive belt was found in a Red Crescent ambulance at a checkpoint near Ramallah. The bomb, the same type generally used in suicide bombings, was hidden under a gurney on which a sick child was lying. The driver, Islam Jibril, was already wanted by the IDF, and admitted that this was not the first time that an ambulance had been used to transport explosives or terrorists. According to Jibril, he was given the bomb by Mahmoud Titi, a member of the al-Aqsa Martyrs Brigade, which the U.S. State Department has listed as a terrorist organization, and which is affiliated with Yasser Arafats Fatah movement. The accusations leveled against Israel by its critics have frequently been based on statements of international law, such as the Fourth Geneva Convention. It is true that the Geneva Convention does place particular emphasis on the immunity and neutrality of ambulances and emergency medical personnel. But the conclusion that Israel must ignore a clear and present danger to its citizens, or else violate international law, is a distortion. It is in fact the Palestinian terrorists, who are using ambulances to smuggle explosives into Israel, that are compromising the Red Crescents immunity and neutrality. 2aQuoted in Sharm El-Sheikh Fact-Finding Committee First Statement of the Government of Israel, Israeli Foreign Ministry, December 28, 2000). 3b"An Engineered Tragedy: Statistical Analysis of Casualties in the Palestinian-Israeli Conflict, September 2000-June 2002," International Policy Institute for Counter-Terrorism, (June 2002). 5aJerusalem Post, (February 22, 2001). 7aNear East Report, (March 5, 2001). 10aJerusalem Report, (May 21, 2001). 11aCNN, IDF, Jerusalem Post, (November 28, 2000); JTA, (March 21, 2002). 12aQuoted in the Jerusalem Post, (April 1, 2001). 14aLetter from George Mitchell and Warren Rudman to ADL Director Abraham Foxman, (May 11, 2001). 15aBriefing by Major General Giora Eiland, Head of the IDF Operation Branch, to the Foreign Press Association, Jerusalem, (May 20, 2001). 18aCollin Powell, My American Journey, (NY: Random House, 1995), p. 434. 19aWashington Post, (June 28, 1993). 19bCNN, (July 16, 2002). 20aHa'aretz, (February 11, 2001). 20bAl-Watan [Kuwait], (June 7, 2002). 20cJerusalem Post, (July 21, 2002). 20dJewish Telegraphic Agency, (June 11, 2002). 21aForeign Report, (July 26, 2001). 22aWashington Post, (August 15, 2001). 23aJerusalem Post, (August 2, 2001). 25aFox News, (August 3, 2001). 26aRonaldReagan.com, Washington Post and other news sources. 28aJerusalem Post, (August 10, 2001). 28bJewish Telegraphic Agency, (November 30, 2001). 29aNews Conference, (September 12, 2001). 30aJerusalem Post, (September 10, 2001). 31aWashington Post, (September 14 and 18, 2001). 32aWashington Post, (September 7, 2001). 33aJerusalem Post, (August 24, 2001). 34aJerusalem Post, (April 25, 2002). 35aJerusalem Post, (April 28, 2002). 36aNew York Post, (May 3, 2002). 37aNew York Times, (April 20, 2002). 38aWashington Post, (April 26, 2002). 40aWashington Post, (January 31, 2002). 41aBomb found in Red Crescent Ambulance, Haaretz, (June 12, 2002). 42aJewish Telegraphic Agency, (June 30, 2002).